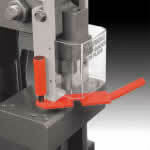 The Oversize Punch Assembly takes the place of the standard Punch Assembly to accommodate punches and dies in various shapes and sizes from 1 in to 1-9/16in. 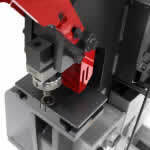 This tooling can be used to punch large holes as well as slots in everything from sheet metal to plate to steel beams. 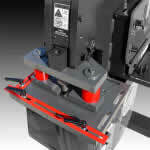 The Pedestal Die Table allows for the punching of flange or web surfaces of 2" x 2" steel angle, channel and beam. 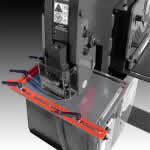 The Urethane Stripper accessory is designed to maintain the flatness of material being punched by keeping constant pressure on light gauge material through the punch and strip cycle. 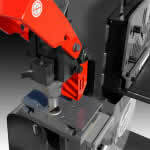 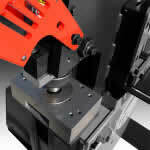 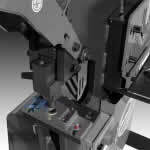 Speeds the changeout of punches for standard or oversize punches. 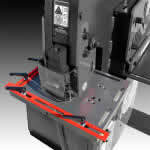 The 3/8in x 12in x 16in punch Gauging Table Kit takes the guess work out of making precise, repeatable standard or oversize.